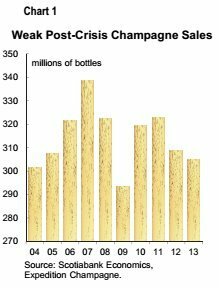 Most businesses slow down around New Year's Eve, but one overflows in sales: champagne. But bubbly makers have been struggling since the recession and might be about to see sales fall further, according to a Scotiabank report. Like other luxury goods, champagne consumption is something of a barometer of the economy and there has been a marked slowdown in sales since the Great Recession, according to economists at Scotiabank. Sales from the Champagne region of France, which has 300 bubbly houses and 15,700 vineyards, peaked in 2007 — just before global markets showed the first signs of the biggest financial crisis since the Depression. “Apparently weak economies have given [people] less reason to celebrate,” economists wrote in a report. When things were rosy in 2007, the Champagne region approved an expansion of the vineyards. Planting of the new vines is slated to begin next year, flooding the already receding market with more supply. In addition, other European countries — even unlikely as the U.K. — have ramped up production of domestic sparkling wine. “To absorb that new supply, producers had better hope that Europe’s economy goes on the mend and soon,” the economists said. But Europe’s economy has been sluggish and a failed vote in the Greek Parliament has sparked renewed concerns about whether it will fulfil its bailout obligations or spark more financial distress across the eurozone. The market is the biggest for champagne, with 55 per cent of the region’s production consumed in France. Other European countries comprise four out of five of its biggest export markets. Champagne is losing market share to other sparkling wine makers and only accounts for 13 per cent of the world’s consumption of sparkling wines. A recent report suggests that Italy’s own take on effervescent wine, prosecco, has surpassed champagne sales in North America for the first time. Canadian producers from B.C.’s Okanagan Valley to Nova Scotia’s Annapolis Valley are also challenging the famed French region’s grip on the market. In Ontario, production has doubled in just five years. Sparkling wine is growing in popularity among Canadians, with domestic wines making up nearly a quarter of the some $400 million in annual bubbly sales.